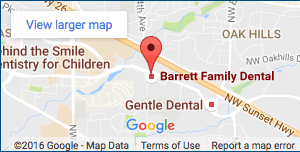 As your Beaverton dentist, the staff at Barrett Family Dental understands that we all suffer from poor habits that can negatively impact our oral health. While some of these types of habits are fairly obvious – like crunching on ice cubes or grinding our teeth – some are a little harder to detect. Here are a few harmful habits you may not realize that end up causing some serious damage to your teeth and gums. While admittedly not for everyone, tongue piercings have actually become more popular in recent years. Unfortunately, accidently biting down on the metal stud that protrudes through your tongue can crack or chips your teeth. One study even suggests that long-stemmed tongue jewelry such as barbells may actually increase your risk of gum disease. Not only can the barbell injure your gums through direct impact, sustained inflammation can cause your gums to recede away from the base of your teeth. Additionally, because even the healthiest of mouths contain billions of bacteria, oral piercings can increase your risk of infection and sores. While sucking on a cough drop can help soothe your throat and relief congestion, most brands of cough drops contain high amounts of sugar. Plaque – a stick bacteria that clings to the surface of your teeth – uses the sugars we eat to produce harmful substances that contribute to the break down of tooth enamel. While you might expect an increased risk of tooth decay if you ate hard candy all day, sucking on cough drops has much the same effect. If you do need a relief from coughing, make sure to drink plenty of water during and after consuming cough drop. Maintaining your oral health means limiting the amount of sugar you consume daily. While most people realize that soda and artificially sweetened fruit drinks contain sugar, few truly understand how much sugar is loaded into just one bottle of soda. The average non-diet soft drink contains 17 teaspoons of sugar! The World Health Organization recommends adults limit their sugar consumption to just 6 teaspoons a day. That means one bottle of soda contains 3 days worth of sugar! Not only do these types of beverages contain too much sugar, these also contain citric, tartaric and phosphoric acids, all of which erode away tooth enamel. Diet sodas don’t offer much reprieve, as studies have found that artificial sweeteners also increase an individual’s risk of tooth decay. As a recent article in the magazine Health outlined, red wine contains chromogens that contribute to the discoloration of teeth pigments. Red wine also contains tannins that dry out the mouth, making teeth sticky and more susceptible to discoloration. White wine also has the ability to discolor teeth, as it contains erosive acids that enable stains from other foods and drinks to penetrate deeper into tooth enamel. By now it should be clear that eating sugar presents problems for your oral health. But while cookies, candies and sodas are often thought of when it comes to items high in sugar, potato chips and crackers are just as guilty. Carbohydrates are just a more complex form of sugar, which means snacking on a bag of chips after lunch presents that same oral health risks as eating a candy bar or opening a can of soda. Stopping snacking in general is a great way to protect your oral health and decrease your waistline, but if you just cannot resist, make sure to drink plenty of water during and after snacking to help wash away any food and bacteria from your mouth. As your Beaverton dentist, the staff at Barrett Family Dental hopes you’ll keep these tips in mind so you can enjoy a lifetime of healthy teeth and gums. If you have any questions about how to improve your oral health, feel free to ask any member of our staff during your next appointment.